Canyonlands National Park is a land of red rocks, filled with mesas, canyons, buttes, and arches sprawling across 337,598 acres. It’s like walking on the moon or Mars without ever leaving Eastern Utah. 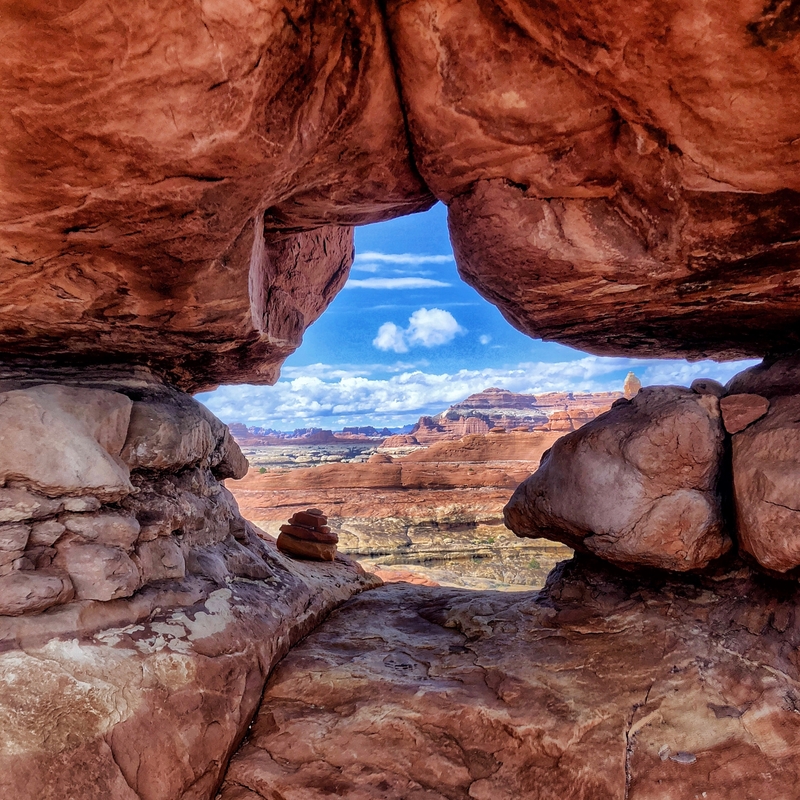 Although there are plenty of viewpoints and day hikes in Canyonlands, we recommend backpacking in Canyonlands National Park in order to experience the most incredible vistas and remotest corners. Backpacking Canyonlands can be logistically tricky, though. For any overnight trip you will need to secure a backpacking permit and be prepared to hike with little shade, water, and cell reception. Canyonlands National Park is separated into several districts, all with their own unique terrain and features. 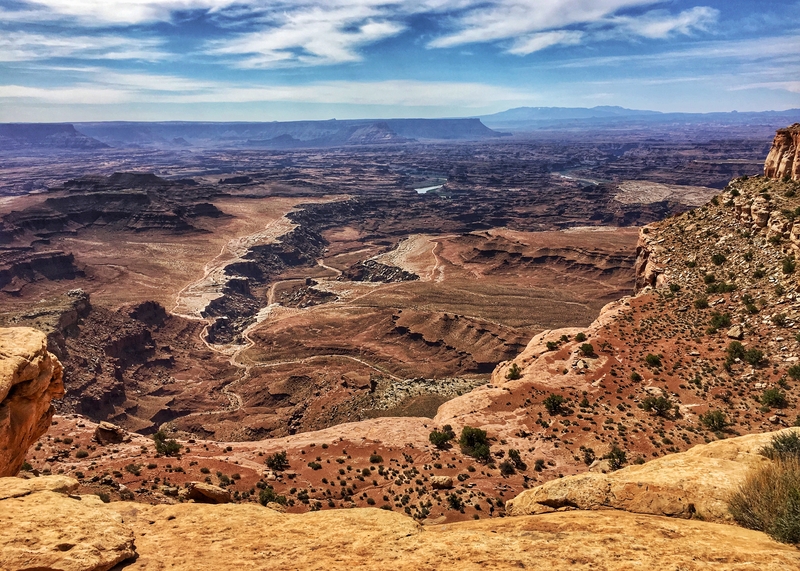 Island in the Sky: This district lies in the northern section of the park and is the most accessible district in Canyonlands, approximately 35 miles outside of Moab. The Island in the Sky mesa is surrounded by the canyons of the Colorado and Green rivers and sits up over 1,000 feet, as if it were floating in the air. The Needles: This district lies east of the Colorado River and is known best for its red and white sandstone spires. There are also ruins and rock carvings left by ancestral Puebloans. The Needles is a more remote area of the park, approximately 75 miles outside of Moab. The Maze: This district lies west of the Colorado and Green rivers and is the least accessible section of Canylonds due to its remoteness and roughness. 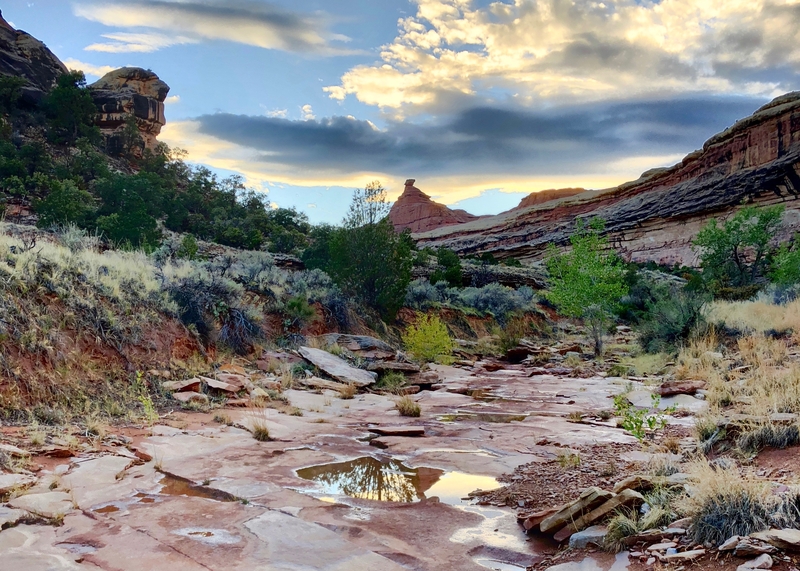 The Maze is located about 160 miles outside of Moab on roads that require high-clearance and four-wheel-drive vehicles. Hikers need to be experienced and prepared to navigate through the untamed trails. There is also a fourth district, which is made up of the Colorado and Green rivers. Backpacking permits are required in Canyonlands National Park. The process seems intimidating at first, but is easy once you know what you are doing. You can reserve a backpacking permit no more than four months and no less than two days in advance of your start date. 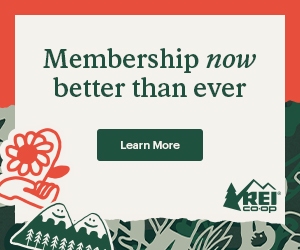 You can also secure a walk-in permit up to one day before your start date at any visitor’s center. Read through this page for more information. In which district do I want to backpack? How many days do I want to backpack for? How many miles do I want to hike each day? Do I want to set up a base camp or stay in a different place each night? Do I want to camp at a designated site or at an at-large zone? How comfortable am I backpacking with limited available water sources? I recommend looking at a map, preferably one of these, to help plan your route. Be aware that Canyonlands is very busy in the spring and fall. 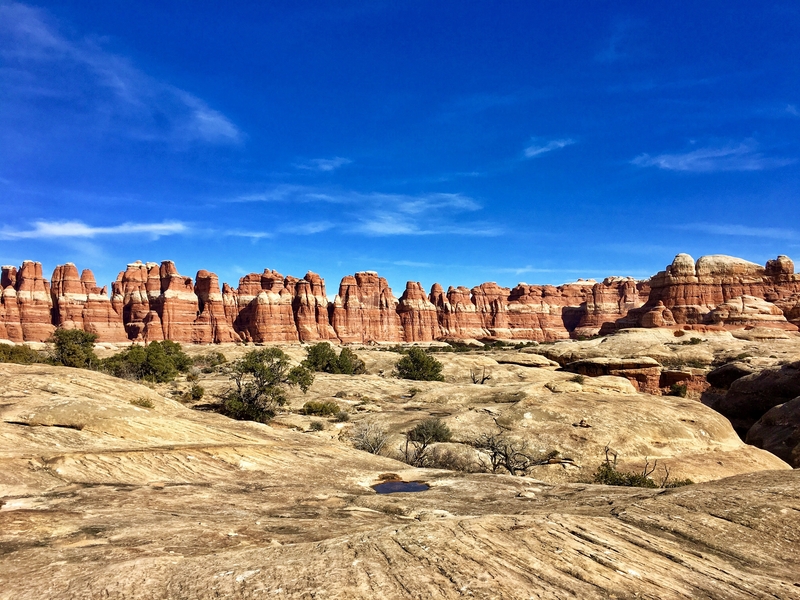 Reservations for popular areas like Chesler Park will be taken up quickly; but don’t let this stop you from making a spontaneous trip. We have planned trips during busy seasons only a week in advance and were able to receive permits for at-large camping zones. Your permit will be processed by the NPS system. Once approved you will receive an email with instructions on how to pay the $30 reservation fee online. If you don’t pay within three business days the reservation will be canceled. You will then either receive an emailed permit or a reservation confirmation. If your receive a reservation confirmation you will need to check in at a visitors center to be issued your permit. This is typically for at-large zone or Maze reservations. You must carry a printed and signed copy of your permit at all times. I do not believe they accept permits on a mobile device. Below are three great starter options for backpacking in Canyonlands National Park. First off, though, here a few important reminders about backpacking in the desert. Make sure to bring plenty of water. There aren’t many natural water sources located throughout the park, aside from the Colorado and Green rivers, which are difficult to use as a source due to the mud and silt. Backpacking in Canyonlands in the dead of summer is not the best idea as there is not a lot of shade and temperatures can reach to the high 90s. Fall and spring offer ideal temperatures at 50-60 degrees, but are also the busiest seasons. Backpacking in the winter will make you feel like you have the park to yourself, but be aware that temperatures can drop lower than 20 degrees at night. Don’t bust the crust. Canyonlands is filled with cryptobiotic soil that looks like a black crust covering the desert floor. It is made up of a collection of living organisms, is important to the desert ecosystem, and is extremely sensitive. It may take a decade for the crust to reform after being destroyed. Most trails in Canyonlands are well maintained and easy to follow. Junctions are typically well marked with signs, but make sure to follow the cairns when hiking on slick rock. Also, please don’t build any additional cairns. Leave no trace. Pack it in, pack it out. Always. Chesler Park is a circular meadow surrounded by pillars of red and white cedar mesa sandstone and is one of the most popular areas in Needles. 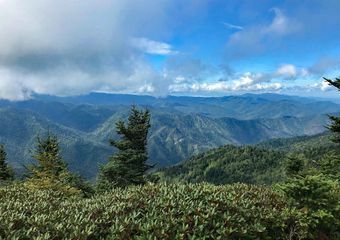 The route will take you over sand and slickrock through tight passages and will offer some of the best views in this district. You’ll feel like you are on another planet. There are a few different routes you can take from the Squaw Flat Trailhead. The most direct is to hike through Elephant Canyon and into Chesler Park. If you’re looking for more miles, you can start hiking through either Squaw Canyon or Big Spring before heading into Chesler Park. With the various route options you can make this hike into a loop or an out-and-back. Salt Creek Canyon takes up the southeastern area of Needles and is quite a different landscape compared to the rest of the district. On the way to the canyon you’ll start hiking on classic desert sandstone, but once down in Salt Creek Canyon things feel a little more wild and lush. While being surrounded by the canyon walls you’ll hike through sandy trails, grasslands, meadows, and streams (yes, streams!). You’ll almost forget that you are still hiking in the desert. In this area you may spot mountain lion prints and Native American ruins. You can hike this as a out-and-back starting at the Squaw Flat Trailhead and make the route as short or as long as your want. The other option is to do a 27-mile point-to-point between Squaw Flat Trailhead and Cathedral Butte Trailhead. A bear canister is required in Salt Creek Canyon. The Lathrop Trail brings you from the Island in the Sky mesa down into Lathrop Canyon and to the Colorado River. 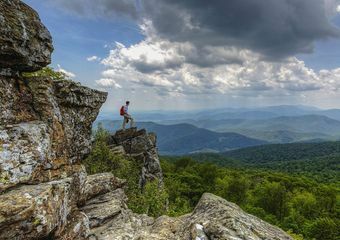 It starts out with hiking through grassy flatlands and slickrock to the canyon rim, where the views are incredible. The trail then drops about 1,500 feet over a series of steep switchbacks to an old mining road that leads to White Rim Road. The trail then transitions to a jeep road that goes all the way to the Colorado River. This trail is mostly flat, aside from the steep climb in and out of the canyon. It is an out-and-back trail with at-large camping in the Gooseberry/Lathrop zone. Michael is an experienced thru-hiker with the John Muir Trail, PCT, Colorado Trail, most of the CDT, and the Superior Hiking Trail under his belt. Then there’s Jenna who is a newbie thru-hiker after just completing the Superior Hiking Trail. We live in Denver and try to hit the trail, any trail, every chance we get. We’re dreaming of doing the PCT in 2019. Follow Michael on Instagram @grizzly_hikes. Follow Jenna on Instagram @justjfaye or on her blog www.justjfaye.com. Great post with some very helpful beta — thanks! A quick question: Do you know when (time of day) the permit system flips over… that is, when the “next” day four months out becomes available for booking?